One of those chores was getting some gasoline. While Ranger Lefty was filling up outside, I went inside to snap some pictures of the one-armed bandits inside; gambling machines being one of the things I forgot to photograph on our Burning Man 2000 excursion. So here you see them, a whole row at right. Amazing, eh? Our next stop is Twin Cities Surplus, a great place to visit even if you're fully equipped for your adventure. They always have something strange and wonderful in their back garden. I bought a set of three metal poles and a three-armed tent spreader, to make the big top nicer. They had a very nice silver isolation suit, but I don't do the firefighter impersonation often enough to justify the money. You can see Ranger Lefty at the left of the picture and a couple hitching a ride to the playa at the right. We did the last bits of food shopping we needed, the perishable salad supplies, ice, and water, and then we were off. 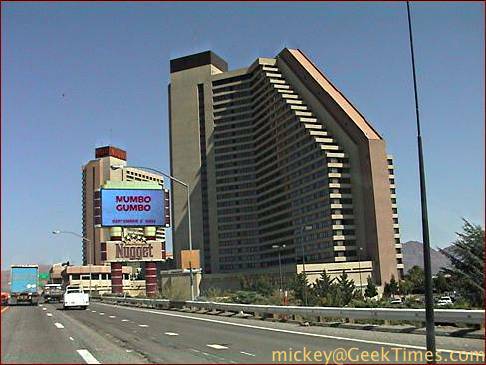 A few moments after we returned to the highway we passed the Nugget, where we've stayed in previous years. The indoor swimming pool - complete with waterfall - is always nice. It's only a few minutes more, past Mustang, Nevada, home of the brothels. You can't see much from the highway. 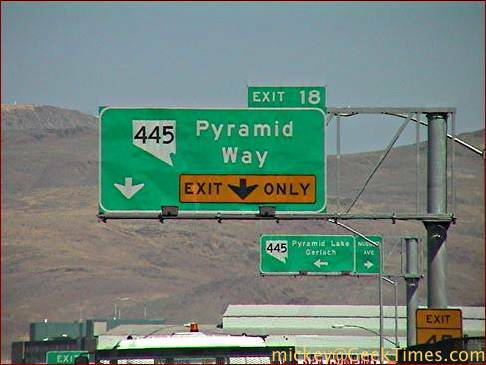 Okay, here we're at exit 43, our destination. Take the exit ramp. At the bottom make a left, under the overpass. Get excited. You're on the last leg of the journey. You're playa-bound!